Some apps are highly focused; Chapters is clearly one of them. Chapters lets you add division markings—yes, chapters—to MP3 files, useful for podcasters who want to provide a quick way for listeners to jump to a segment or past one. It’s also handy for making a single long MP3 file of a music performance, album, or lecture, and marking points along the way rather than dividing into individual audio file tracks, which have to be managed. Divisions could be added to AAC files using a format defined by Apple to create so-called enhanced versions for years, but which aren’t universally supported. An AAC chapter break can contain a title, a URL, and an image. A fair amount of OS X audio software, starting with the bare-bones and very useful Fission editor from Rogue Amoeba, supports AAC chapter creation and editing. Chapters simple interface lets you set basic MP3 chapter parameters. Chapters fills a missing niche and is currently the only OS X app to do so. It allows simple insertion of chapter marks, along with a label and a field defined as a URL for that label. It has a captive market for those who want to take advantage of chapter marks in MP3. Its utility stems from the increasing support about podcast apps to display chapters for navigation. It was part of the Overcast update to version 2, a free donation-supported podcast player that appears to have been downloaded hundreds of thousands of times. But support also appears in Downcast, iCatcher!, and Apple’s mandatory Podcasts app. Each app handles showing chapters differently, but they all display the list, have a way to click or tap to jump to that point in the audio, and enable a clickable link when a URL is specified. This metadata is simply ignored by players and audio editors that can’t interpret it or modify it. Chapters has a simple purpose and a straightforward interface. Launch it, and you’re prompted to select an MP3. It opens with any chapters already set and lets you scrub through the audio and click the + sign to add a chapter at the point. You can adjust the time by entering values manually as well. 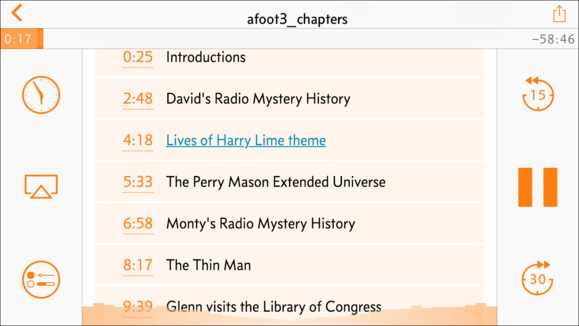 Each podcast chapter marker lets you set a label and URL, and you can click in the list chapters to edit those values, or click the play button above the chapter information to start playing at that point. When you’re done editing, you export the file. Be sure to export as a new file name rather than replacing your original file: I found the data wasn’t retained when I chose that route. All existing metadata in the file is preserved, even though it’s not displayed in Chapters. 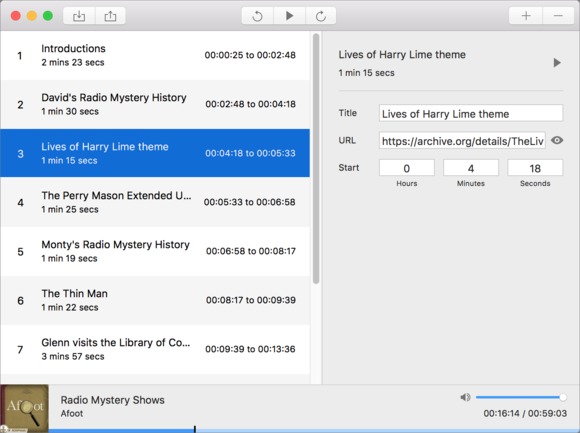 That may come in a future release, and it would enhance the program, turning it into more of a full-fledged audio metadata editor. Chapters executes well on its feature set, but it should stretch in future releases, especially at its current price ($15 during a launch special; $20 later). For example, instead of editing chapter data directly in an MP3 file, Chapters could allow the creation of chapter information for audio that’s saved independently, and then allow applying that data to an MP3 and AAC file created by a user, with the appropriate features for each. That’s a minor quibble, though, given Chapters allows a feature you can’t otherwise get. For those who need it, the price isn’t an obstacle.